Four primitive campgrounds are available in the Auburn State Recreation Area. Camping is limited to 14 consecutive days, with a 30 day total camping limit per year. Reservations for Lake Clementine Boat-In Campground are only taken through www.ReserveCalifornia.com (call 800-444-7275). Mineral Bar Campground and Ruck-A-Chucky Campground are operated on a first-come-first-serve basis. On the east side of the North Fork American River, where the Colfax Iowa Hill Road crosses the river. There are 16 designated campsites with tables, firepits, and dry toilets. No drinking water is available. A narrow paved road serves the campground. There is a 14 day camping limit. Dogs are allowed. Directions: From Hwy 80 in Colfax exit at Canyon Way, head north on Canyon way turn right onto Iowa Hil Rd. 3 mile paved road to sites and river. Fees: $28.00 year-round per night. One extra vehicle allowed per campsite is $10.00 per night. 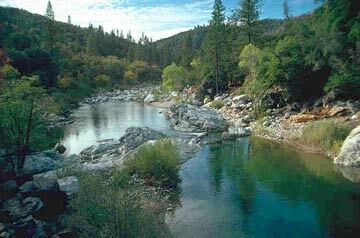 Five primitive campsites are located on the north side of the river on the Placer County side. Toilets and trash cans are provided. No drinking water is available. The campground is at the end of a 2.5 mile gravel/dirt road. Vehicles with high clearance are strongly recommended. The road can be closed during inclement weather. Dogs are allowed. Directions: From Hwy 80 exit at Foresthill Rd. Going towards Foresthill turn right onto Drivers Flat Road, a 2.5 mile dirt road down to the site and river. Fees: $28.00 per night. One extra vehicle allowed per campsite is $10.00 per night. Note: Ruck-A-Chucky campground is closed in the winter. *For a map of the Ruck-A-Chucky and Mineral Bar campgrounds, please see the Campground Rules and Regulations. Boat-in camping in 15 primitive sites with pit-toilets, picnic tables, and fire rings. Open May 1st - September 30th. Campgrounds are shortly operated on a first-come-first-serve basis from May 1-14. Starting May 15th through September 15th the campground will be done by reservation only through ReserveCalifornia. From September 16th - September 30th the campground is operated on a first-come first-served before closing for the winter. No drinking water is available and dogs are not allowed. There is a 7 day camping limit. Directions: From Hwy 80 exit at Foresthill. Follow Foresthill Rd. 3.5 miles , then turn left at Lake Clementine Rd. Follow 2 miles down to the boat ramp. There is no vehicle access to the camp areas, which are accesible only by boat. Fees: $38.00 per night, $10.00 boat launch, $10.00 for extra vehicle. Note: Lake Clementine campground is closed in the winter. Permits are available for camping in some areas outside of the designated campgrounds for those rafting the American River only from October 16th to June 31st. River Permit camping is prohibited July 1st- Oct. 15, due to high fire danger. Information and permits are available at the Auburn SRA Ranger Station, 501 El Dorado Street in Auburn. Reservations are only for Lake Clementine Boat-In camping. All other areas are first come first serve. Dogs are not allowed at Lake Clementine. Dogs are allowed at Mineral Bar and Ruck-A-Chucky. Dogs must be on a leash or secured inside a vehicle or tent at all times. Fires are allowed in fire pits, where provided. Campers are requested to bring their own firewood as firewood is not available at the campgrounds and wood gathering is strictly forbidden. Please clean your campsite and extinguish all fires when leaving the area. For a map of the Ruck-A-Chucky and Mineral Bar campgrounds, please see the Campground Rules and Regulations.